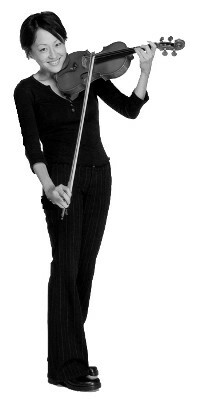 Searmi Park is a violinist in the Los Angeles Chamber Orchestra. She was born and raised in Los Angeles. She began studying violin at age six and graduated from the Crossroads School for Arts and Sciences in Santa Monica, California. She went on to study at UCLA under violinist Mark Kaplan, receiving her Bachelor of Arts and Master of Music degrees. Searmi spent summers studying chamber music in Taos, New Mexico with the Takacs and Chicago string quartets. She also studied with pianist Robert McDonald and at the Yellow Barn Chamber Music Festival. She served as first violin of the Alma String Quartet. The ensemble won a prize in the Coleman Chamber Music Competition and was featured in the UCLA Performing Arts Series at Royce Hall. Searmi, who joined the Los Angeles Chamber Orchestra in 2001, also regularly plays with the Los Angeles Philharmonic, LA Opera Orchestra and Pacific Symphony. She has played runs as concertmaster and assistant concertmaster of the New West Symphony and the American Ballet Theatre, Miami City Ballet and Kodak Theatre orchestras. Searmi has appeared as a soloist with many orchestras, performing concertos by Brahms, Sibelius, Beethoven, Prokofiev and Mozart. She resides in Glendale, California with her husband and two children, Benjamin and Matilda.